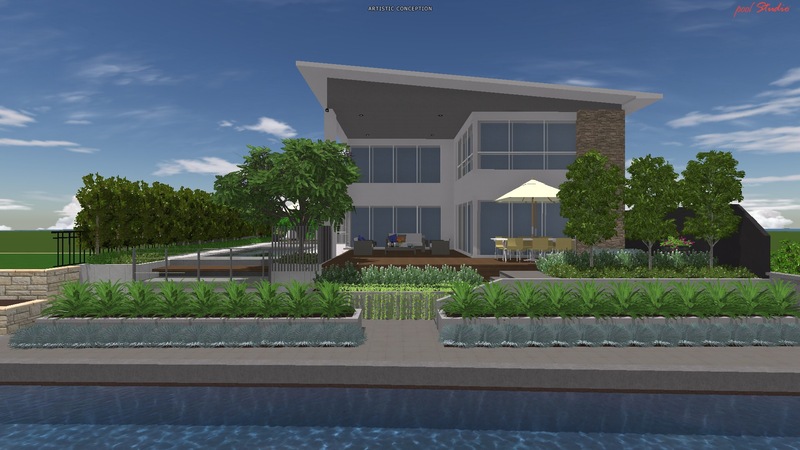 Rugs | House by the water. Today we walk up the ramp to stand on our floating jetty. The neighbours’ fixed jetty (far right) is submerged. We only just got to the barbecue as it was rolling towards the edge of the open deck, propelled by wind. The kayaks were about to set sail, unmanned, as the storm surge lapped over the edges of the canal walls. The pool is being filled, a kind of icky green colour. The hail has just stopped. Banging doors kept us awake half the night, but there are no puddles on our floors, nor water stains on our ceilings so I’m pronouncing the weather testing a success. We are fast approaching the end of our 6 month maintenance period and need to finalise our list of items to be fixed by our builders, Webb and Brown-Neaves, so the timing of the lousy weather is rather good. Wading through the bottom level of our canal-side yard. Current landscaping project. Plus, nothing beats a good storm for providing a legitimate excuse for a day off shovelling, or whatever other landscaping task I should be doing. Time, instead, to blog. What’s new? Shutters! Actually they’ve been in a few weeks now and I’ve been waiting in the vain hope that one of the Three Little Pigs might have a bedroom tidy enough for a blogworthy photograph. 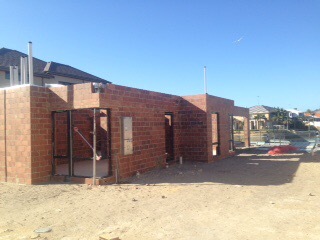 The bedrooms and library all have shutters and are all rooms that are low priority works-in-progress. So I’m going with a couple of “keeping it real” photos for you. New shutters in sty number 2, on a good day. The shutters look good from the exterior too, but today is just not the day to prove it to you. I didn’t want to spend too much on a rug for the dining room, it’ll probably only last a year or two under our dining table. I picked a wool blend rug from Freedom, with enough colour in it so that I don’t cry the first time it cops a bowl of spaghetti bolognese. The weave is thin enough to vacuum the crumbs easily and thick enough to absorb some noise. I think it has helped and I must say it’s nice under my feet on cold mornings. Rug addition number two is multi-purpose. Armadillo and Co. hemp runner. It is to catch any stray hot embers that fall out of the wood fire when we stoke it, to protect our timber floor. I needed something that could disguise any soot marks and preferably something with some fire retardancy. I hoped for wool but couldn’t find anything the right size. This Armadillo and Co. runner is hemp. When the fire is not going, the rug doubles as a door mat between our deck and the living room. Grass trees and kangaroo paws. I came home with 21 kangaroo paws in tubes. 21 wheelbarrow loads of dirt and two weeks later the kangaroo paws are all planted and enjoying the rainy weather. The professional landscapers have completed their day of work for the month, so I’m guessing I won’t see them again now until June. Most exciting is that I received a present that my husband gave me for a certain conspicuous birthday. My big art. It’s an indigenous dot painting by artist Margaret Lewis Napangardi. I said “wow” the first time I saw this painting in Japingka Gallery‘s window. Now it’s in our living room and I love it! With the exception of the bathrooms and laundry, our floors will be blackbutt timber. We’ll need plenty of rugs eventually but, for now, the main rug of concern is for the living area. There are various opinions about how large a rug should be in relation to a room and “rules” about sofa feet being on or off the rug, but I’ve noticed that some of the most stylish of rooms don’t follow the rules. Some chairs on, some off. Picture Sources: 1. Desire To Inspire 2. April and May 3. West Elm 4. Domaine Home. For our living room, I’m subscribing to the “large makes the room look large” theory. At a minimum I want the rug to sit under the front feet of the sofa. At a maximum, I want to leave 20-30cm from the walls, so you can still appreciate the timber floors and to keep the rug clear of ash that might fall out of the fireplace. 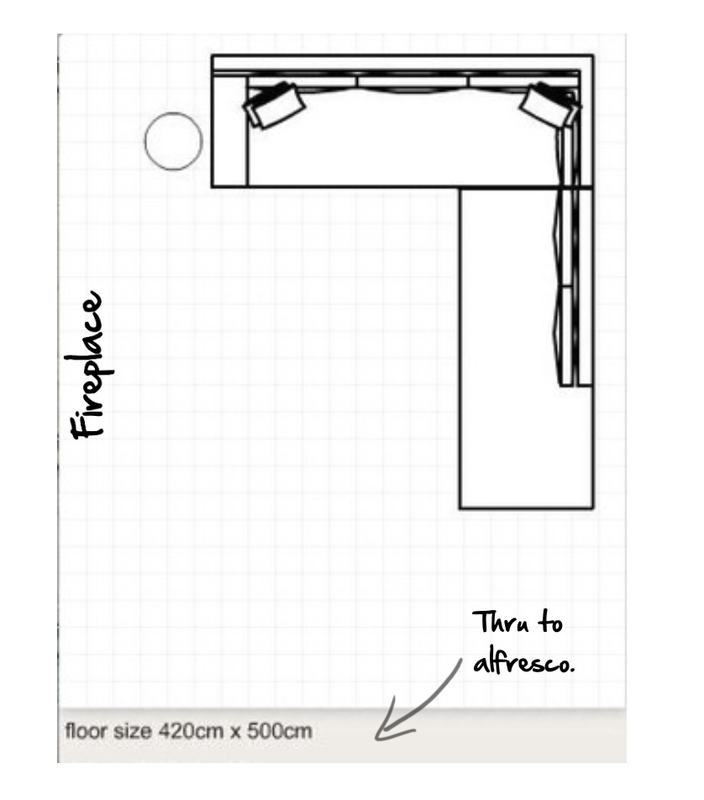 I used Jardan’s room planner to map out the likely location and size of our dream sofa in our living room. From this I took the measurements for the rug. Each small square is 20cm square. Maximum size 3.5x 3.4m. Minimum size 3 x 2.2 m. Big. However, if I was to fall in love with a rug outside these dimensions, then I think it could be done. Many off-the-shelf rugs do not come large enough to fit my requirements. Sources: 1- 3: Jenny Jones Rugs. 4: Sanderson Home Rug at Yarn and Loom. 5: West Elm. 6: Designers Guild. Sources: 7 & 8: Armadillo&Co. 9. West Elm. Sources: 10-12: West Elm. 13: WorldWeave. 14 & 15: Freedom Furniture. Right now, pattern is winning. The sofa will be plain, so some pattern won’t go astray. Cotton/thread ✔ I’m a sucker for a good kilim. Silk or a silk blend.✔ So nice under foot. Wool ✔ Sometimes. I have a great wool rug from Freedom that is at least 10 years old and has been very resilient to herds of wild children and questionable house keeping. But some wool rugs look like they need a good shear. They are a bit fluffy and shed! 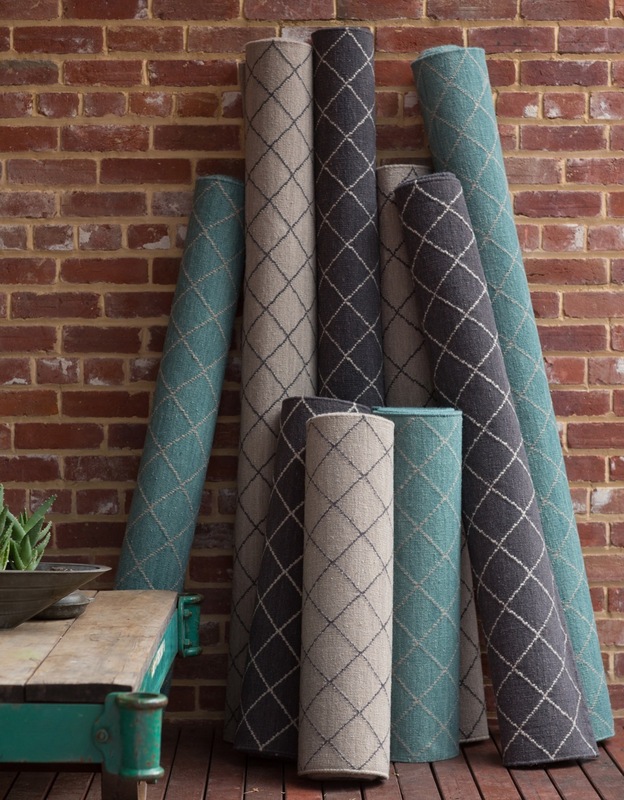 A few rugs that I recently saw at Pottery Barn fell into this category. Which rug do you like best? Are you eyeing off an alternative? Have I missed any secret rug shops? You know, I usually like to consider Australian made options, but I couldn’t find one I like under $1000, not even under $3000. If you are still not overloaded by rugs, you’ll find more in my Pinterest file.